Clothing for Care Homes | Nursing home Residents Clothing |Suppliers of Clothing for Older Women |Rival Clothing. We have been retailing Clothing for the past 22 years and have in that time become more concentrated on clothing for the older Lady. Discovering that most stores now don't continue to cater for our type of clothing has lead us into this niche market. We also discovered that this type of product was also not available any more to the rest of the world, yet the more senior Ladies still prefer to wear these styles. 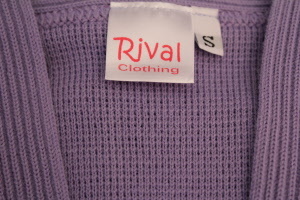 Today Rival Clothing caters for customers all over the world through the internet and continues to grow with the introduction of many more lines for the older women or elderly Ladies. In order to keep our on-line store fresh, we constantly introduce new patterns to our range on a monthly basis, as many of our customers are repeat business for us and want a different pattern or style. For this reason we don't produce a catalogue or brochure to send out to customers .